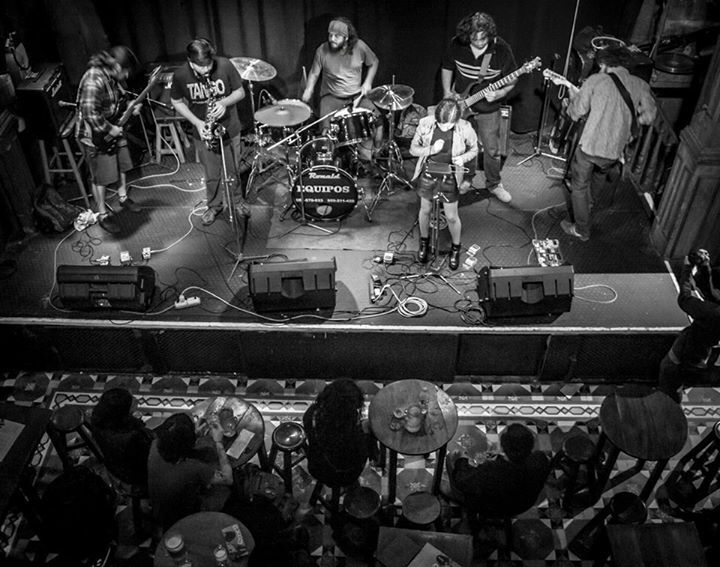 Cholo Visceral are a six-piece psych/ prog rock band from Lima, Peru. The band have been through a number of personnel changes since originally formed as a duo in 2011, becoming a seven-piece outfit to record their first, self-titled, album which was released on CD in 2013 (Toxiko Producciones – Peru), and on vinyl in 2014 (GOD Records – Greece); and still available to download on the Cholo Visceral bandcamp page here. The band originally released a digital version of this second album on their aforementioned bandcamp, with the CD again coming from Toxiko Producciones, back in April of this year; but is now getting a much needed vinyl release from Germany’s Tonzonen Records. This is an album that seems to have a number of genre’s crashing together. There is an undoubted space rock influence with Hawkwind guitars, improvised free-jazz style approach, and a saxophone sound which gives the album a voodoo edge that at times threatens to take the band into chaos. The first track ‘Explosión del Misti’ is a case in point as it at times almost seems to be running two narratives with the sax variously going with and against the flow. When it does the latter it is indeed a visceral experience, and then when the band let go to engage with the former they nearly run away with the tight melodies which gain momentum as quickly as they are lost into the next chaotic bridge. This is a long track which covers a lot of musical ground in its just over twelve minutes closing with a great interplay between sax and the rest of the band. ‘Muca’ begins in a much more rock-like fashion, here all the instruments are pulling in one direction in what is a really focussed improvisation, with some really satisfying repeat patterns and a wonderful dose of theremin being administered through the mix. Just after two minutes there a great change of key that settles the track in for the duration in a way that with really satisfy fans of the stoner end of space rock. Like many tracks on the album though ‘Muca’ keeps you guessing all the way through taking right and left turns thereby turning the atmosphere of the track in an instant. Next up is ‘Cholacos’, the longest track of the album at just over sixteen minutes. Given it’s length and the nature of this album it would be a long essay in itself to describe everything that is going on here, but it is kept coherent by a central coda which the band keep coming back to. Again this is a track full of energy and drive, one which never meanders but somehow remains focussed on the goal always building towards the next high. After that I found myself wanting something a little more downbeat to recover from the sheer energy being fired at me. This is exactly what I got with ‘Jarjacha’ which begins with some lovely vocal, acoustic guitar and theremin. Every so often the band threaten to ramp the sound up into a frenzy once more but these interludes are short lived and the overall accent of the track is a soft, almost folky, ‘latin’ approach. Following on from that the band return to full on chaotic mode with ‘Cholo Visceral’, a real melange of sound that takes quite a few listens to sift through. There is much more of a jazz approach to this track which, even by this album’s standards, has a tenor of dissonance. Yet there is also a degree of whimsy here which I found quite disarming. The album starts heading home with ’10 años de terror’, which feels much more serious in tone (and title). There is some really good interplay here between the different instruments, which initially seem to take rapid turns above the back beat. This track is much darker in approach with, in places, stoner guitar layered over some forebodingly sounding keyboards. There is a real sadness to this track which is hard to isolate, a feeling of something lost. Last up is ‘El paso entre los lomas’ which begins in the same sort of dystopian tones with the synthesised tolling of an electronic bell. The is much more space to this track compared with the sheer intensity of most of the album. Piano and theremin combine beautifully, contrasting sharpness with a sense of haziness in the background. Probably the most abstract track, this is one final revelation in an album of surprises, a sparse ending to what has been something of a sensory overload. When I first listened to this album I came away with an overall sense of a South American band producing an album that one might regard as being a straightforward hybrid of latin and more traditional rock sounds. A closer listen, however, reveals it to be much more than that. When I stopped what I was doing and put aside my assumptions, I realised that here was an album that took you on a wild and wonderfully unpredictable journey that was as satisfying as it was varied. If you have an open mind for such things you are really going to like Cholo Visceral Vol. II. ‘Vol. II’ is available to pre-order now on limited edition double-vinyl (500 copies: 300 blue, 200 black) with gatefold cover including band photo & sticker from Tonzonen Records here.